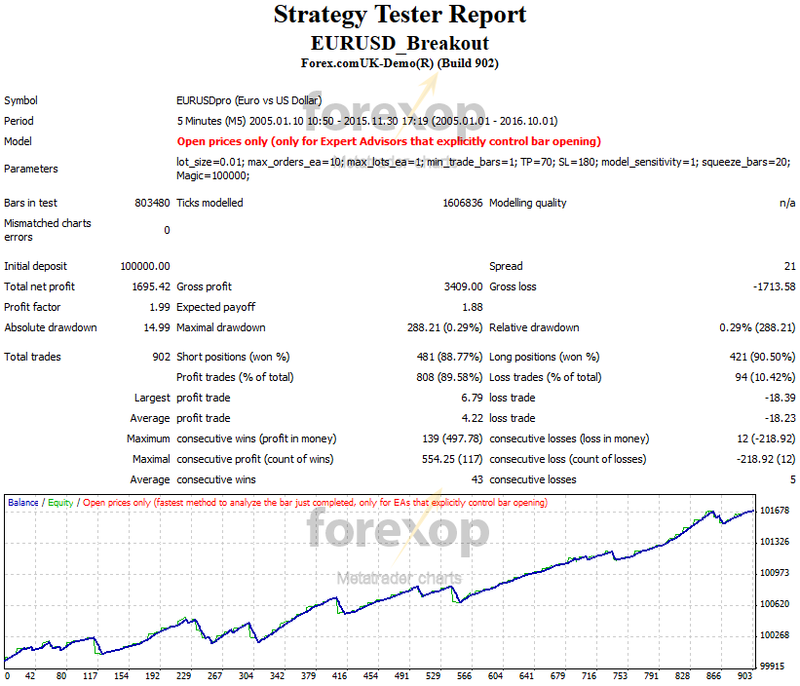 A free Metatrader expert system for trading EURUSD breakouts. 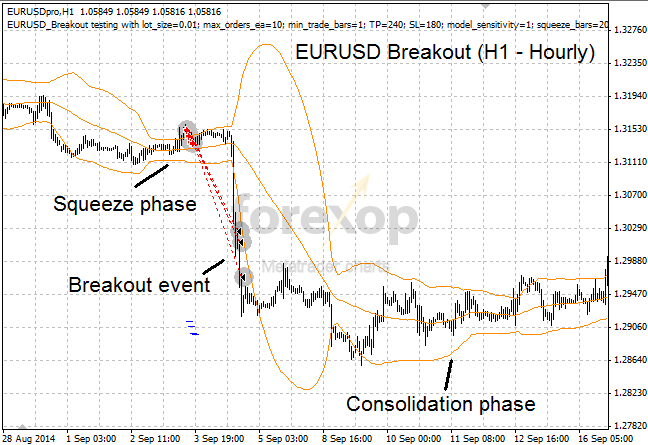 This strategy uses 9 different signals to anticipate the timing and direction of volatility breakouts in the EURUSD chart. Breakouts as they are called by “chartists” are large directional price movements. This EA analyses a number of technical inputs in order to predict when a breakout is about to take place and in which direction. It then places trades accordingly. A breakout strategy can complement other trading styles and provide diversification. Significant breakouts are “event driven” in that they often happen around the release of important information. Minor breakouts, which are more frequent, often have a “technical pull” behind them. Both types can be traded profitably by this expert. Having a breakout strategy within your portfolio can make sense for a number of reasons. Explosive breakouts can often move the pair by several hundred pips within a short space of time. Thus breakout events often create highly profitable trading opportunities. See Figure 1. To learn more about trading breakouts see this article. With a daily turnover of around 1.5 trillion dollars, EURUSD is the most liquid and actively traded currency in the world. If you look at a chart of EURUSD you’ll see that breakout events happen with surprising regularity and within every time frame. The deep liquidity and stable volatility range of EURUSD make it an ideal market for this strategy. 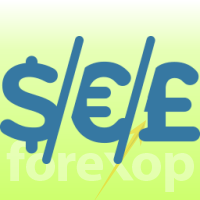 This EA is specialized to trade EURUSD. However there aren’t any limitations. You can readily use it to trade other markets as required. Though, in this case some additional testing and optimizations might be needed. Custom settings allow the system to trade as cautiously or aggressively as you want. With a cautious setting, the EA will trade less frequently. With a more aggressive setting, the EA will trade more frequently. The trade-off is that with a more aggressive setting there will be a higher chance of trading on “false breaks”. These are so called, “false positives”. When a profitable breakout happens, the EA will realize profits quickly. If profits aren’t able to be realized quickly, the EA will start to close positions at the most profitable point. This way positions are held for a short a time as possible. Both profit and loss levels can be controlled. The “cutoff” stop loss sets the level at which the EA will consider the break to be false. The initial take profit will be used as a target. However if this isn’t reached within a set time, the EA will automatically step down to a lower profit threshold. The expert allows both grid mode and single trade mode. With grid mode, the expert will place a sequence of trades as a grid. For example, with grid mode, instead of trading one single block of 1 lot, you can place ten trades of 0.1 lots each. Using grid mode can lead to better “price averaging” and therefore more consistent returns. The EA works best at shorter timeframes as these allow it to analyse price action at a more fundamental level. The one minute (M1), and five minute (M5) charts tend to be the most effective. Nevertheless, higher timeframes can also work.